Written by Clark Dalton, SLP in Ephrata, Washington. Aphasia is an acquired neurogenic language disorder that can affect spoken-language expression, spoken-language comprehension, written-language expression and reading comprehension. And if that sounds too convoluted, then you can boil it down to having problems with speaking, understanding, reading and writing. While aphasia almost always involves word-finding deficits, that is only one of the four areas listed above. Because the brain is a complex collection of neural connections, aphasia rarely occurs in such isolation that it affects only one part of communication. However, the phrase I hear connected with aphasia most often by patients, doctors, nurses and other therapists alike is “trouble finding words.” As stated above, this accounts for only one of four possible language-skill areas affected by aphasia. During Better Hearing and Speech Month I posted on Facebook about what a speech-language pathologist does and got an overwhelming response. I realized that most people have no idea who I work with, what I do, or why I do it. I wanted to raise awareness for where I work and what I do so that people would stop thinking in stereotypes and assumptions and open the door for greater empathy, understanding and respect. I now realize that most people with aphasia feel exactly the same way. They want people to understand the struggle they go through every time someone talks to them. They want people to recognize what it means when they say they have aphasia. They want people to know that every time they speak they are risking frustration and/or miscommunication. They want people to know that while speaking can be as hard for them as moving a paralyzed arm or leg, they are trying their best. They want people to know that getting out any and all words, phrases, sentences or gestures is a big deal and should be celebrated the same as when a finger or toe on an affected limb is wiggled voluntarily. They want people to know that understanding what everyone around them is saying can at times be more difficult than speaking themselves. They want people to know that just because they have trouble expressing themselves, that does not mean that they are less intelligent than they were before their stroke. They want people to know that not being able to read or write can be just as frustrating as not being able to speak. There are several websites dedicated to increasing awareness of aphasia, but they need help to spread the word and create bridges of understanding between people with aphasia and everyone who interacts with them. Try sharing any of these websites on social media: National Aphasia Association, National Stroke Association, Lingraphica, AphasiaAccess. I guarantee the response you get will surprise you in some way. Let’s all work together to change the conversation about aphasia. I find your article very interesting. I’m a bit excited to know that my mom actually had something that has a name. She is gone now, but I am so glad to find this article. In her last days, she lost her power of speak words that could be understood. I’m thankful because I want to read all I can about Aphasia with hope that there is something we can do to help others with the same problem. Thanks for a very informative article. I do love what you all are doing for folks with physical limitations. Being able to speak with understanding is a wonderful gift. 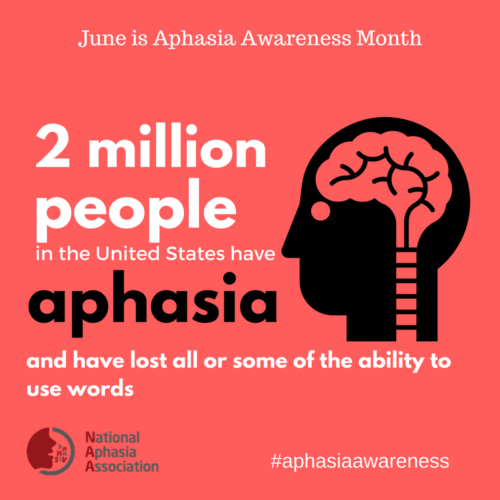 Glad to know June is Aphasia Awareness Month.